Before I even dive into all of these, I know what so many of you will be thinking and might even ask, “Which ones to take and how much of each?” Here is the answer: Read my post on the Beginners Guide to Digestive Health Testing. Go from there because beyond knowing whether or not you have SIBO, you must know that the various natural 13 natural antibiotics for SIBO are conducive for methane dominant SIBO, hydrogen-dominant SIBO or both. Please remember that A Gutsy Girl is a research and journalistic site for all things gut health and healing. I am empowering you to take action with your doctor, nutritionist, and/or other medical provider. p.s. Dr. Pimentel stated, “Well, natural antibiotics are still antibiotics. Bacteria still get resistant. That’s where we get our penicillins: from the plants.” Always proceed with caution on both antibiotics and natural antibiotics. Know exactly what you’re doing before doing it. Allimax (Allicin). I talked about this one in Garlic and SIBO because Allicin is a compound obtained from garlic, which is found in Allimax. According to Allimax, Allicin works because it, “is able to react with micro-organisms and penetrate their cell walls. At low concentrations of allicin, the degree of interference may not be lethal, but sufficient to block the microbe’s virulence. At slightly higher concentrations, the effect can prove lethal for the micro-organism.” You can buy it HERE. Berberine. Berberine helps support a healthy balance of microbes in the GI and respiratory tracts, and consists of a compound found in Oregon grape, barberry, goldenseal, and other herbs. It’s typically used in conjunction with Allimax and Neem. Neem. This comes from the tropical evergreen Neem Tree, which has helped with health conditions from diabetes to heart disease. It is used for SIBO only really in conjunction with Allimax and Berberine, as it helps boost the immune system. Oregano. Go to any SIBO forum and you will see everyone talking about Oregano. You must take Oregano. Please know that this does not (necessarily) mean running out, buying an Oregano essential oil and ingesting it. Do your research. There is the A.D.P. Oregano and oil of Oregano. I’ve heard of both being use (effectively and non-effectively). Oregano is a natural, powerful antibiotic, which is why many will choose to use it. Dysbiocide. Dysbiocide supplies a proprietary blend of herbs and herbal extracts to support normal gut health and foster a healthy microbial balance within the gut by eradicating non-commensal flora. I have used (use often) Dysbioicide as a stay-away-forever SIBO maintenance herb. I even put it on my supplement minimalist list. I do not take it with FC Cidal, but if you’re using this in place of an antibiotic, they do recommend the combination. FC Cidal. FC Cidal is a blend of (7 herbs) botanical extracts that help restore microbial balance. Using the FC Cidal + Dysbioicide is a protocol used by the multi-center team in a 2014 study. Wormwood. Artemisia absinthium, referred to as Wormwood, possesses several medicinal compounds, which include anti-inflammatory, antimicrobial, and antioxidant properties. Apart from being used as the primary ingredient in absinthe, wormwood has been traditionally used to increase appetite, treat digestive disorders, cure fever, and much more. Lemon Balm. If you remember from long ago, I was drinking Lemon Balm via tea as part of my healing protocol. I need to stock up on this one again because it’s just a great way to keep stress and SIBO at bay. Lemon Balm has been shown to cut down some of the bacterial overgrowths that trigger SIBO. It also has implications for the nervous system which plays 100% into the healing of SIBO. Atrantil. According to Atrantil, “It is formulated by a board certified gastroenterologist to naturally and safely disrupt the the methane production by removing the unwanted bacteria from the small bowel and send them to the colon, where they belong.” I took this off-and-on, namely as a follow-up to the antibiotics; sometimes in conjunction with them. I found it really worked and then it didn’t if you read my final 28-day journal. That said, maybe it did work because I stayed on it, in misery, for most of the 28 days. I then went off it. I haven’t relapsed since. Cinnamon. Cinnamon reduces inflammation, helps to regulate our immune system, and reduces bacterial overgrowth. Dr. Siebecker has been known to use a combination of Allicin, Oregano, Berberine, Neem, and Cinnamon in treating SIBO. Candibactin-AR. CandiBactin-AR is a blend of concentrated essential oils and herbal extracts from the aromatic mint family in a formula designed to support intestinal microbial balance and healthy digestion. It is taken in conjunction with Candibactin-BR. Candibactin-BR. CandiBactin-BR is formulated to support a healthy microbial balance and the removal of unwanted compounds from the body. It is taken in conjuction with CandiBactin-AR. 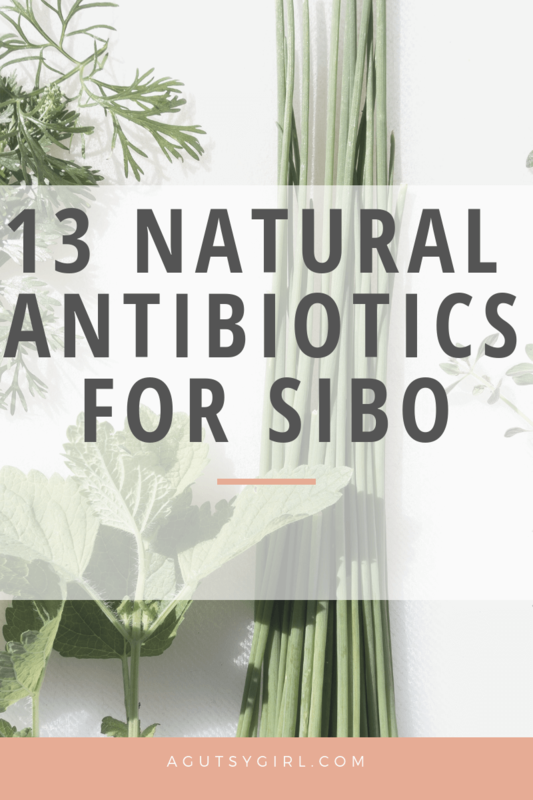 Are these 13 natural antibiotics for SIBO it? Not even close. They are probably just the most talked about. If you want to learn more about these or herbs in general, check out the Online Herb Encyclopedia of Knowledge. Remember, if any (or all!) 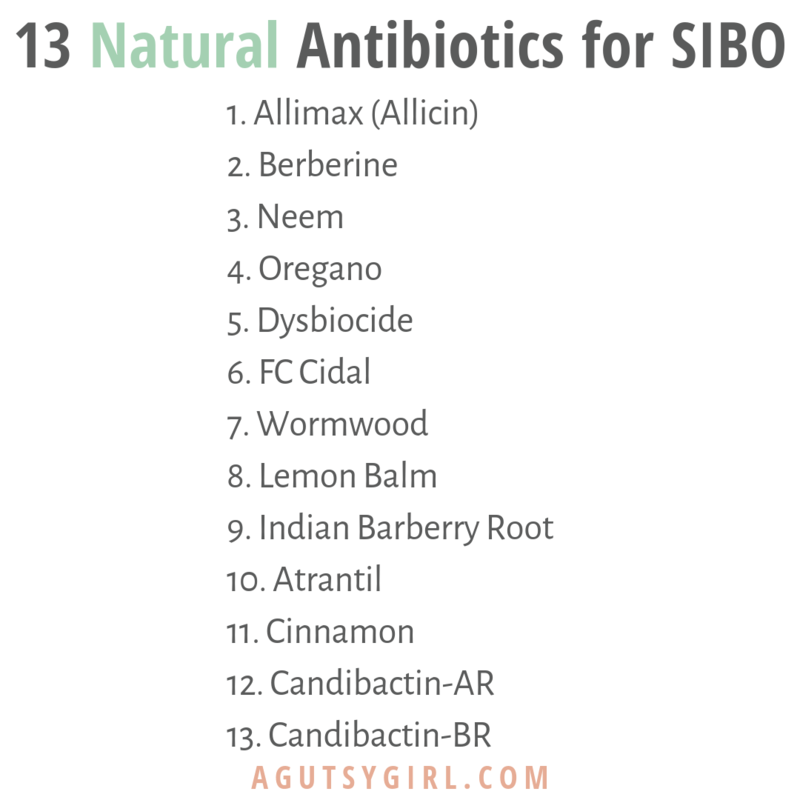 of these have not worked for you or are not working, and you need a SIBO antibiotic(s), it’s okay. Do not stress about it. Just do what you need to do and move forward. And by the way, even if/when the natural antibiotic and/or antibiotic works, if you don’t address the underlying cause for your SIBO in the first place, none of this will matter because it will come back. And it usually comes back with a vengeance. Mine did, but it’s been almost a year. Hi Cindy – Thanks for reaching out and stopping by. I just think anything to help boost your immune system and support any healthy bacteria. Just give it time, and know that your gut bacteria can change in as little as three days so you’ll be fine with consistency.